The now familiar mantra of ‘Will (or wool) it crochet?’ has been applied to all things in the auntiedotes household. Including birthday partys. I can’t really say why the goomba- an often seen Mario character, but really the lowest of Bowser’s underlings- appealed, but it did. And so I dedicated a Sunday or four to the production of this little family of goombas. The pattern is easy to follow so that even someone as new to crochet as me can do it. The fact that they all came out different sizes is definitely my fault rather than the pattern. Now…question is, what does one do with a family of goombas after this party?? Can it be crocheted? This is the question asked regularly in the auntiedotes household, now that I have the skills. And the answer? So when the idea of a floral crown being created out of tissue paper came up…let’s crochet it instead. Here I have to acknowledge that my crochet genius does not yet extend to creating my own patterns and I very helpfully found a pattern in Inside Crochet magazine. The large rose is super fun to make, especially when it seems like it’s going wrong making me pull it out several times before trusting that I am reading the pattern correctly. As it comes together it all makes sense. Ahh (I now have a small collection of roses, if anyone needs one). The pattern is for a much more elaborate crown, but I like this simpler version that i put together (it felt achievable to do it this way). 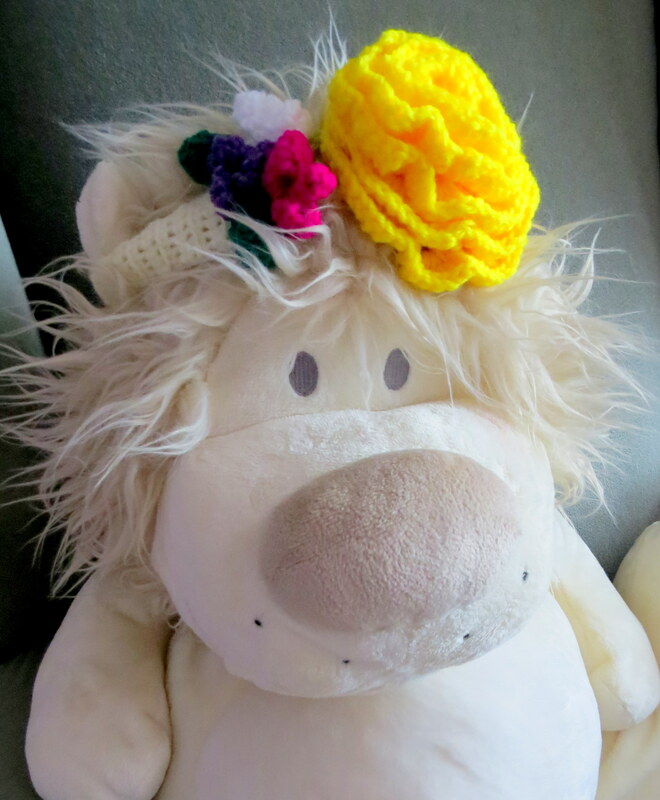 The small base to attach the flowers to just wasn’t working for me, so I made a simple double crochet band crocheted in to a hair bobble at both ends, eh voila, a headband any lion (or little girl) can be proud of. Roll on halloween for Lil D to get to wear it! Sunday is our catch up day. We plan for the week ahead and recharge from the week that’s been. Usually this makes for a loungey casual kind of day that disappears with tea and tv but once in a blue (or blood) moon Sunday becomes a supercharged Get Stuff Done day. Like today. Brunch. Is there a more perfect meal? Great food to get happy about. So what if your first hollandaise splits? It’s always preferable to make a second hollandaise than have no hollandaise at all. Eggs benedict starts a day off right. Than there’s the lime coconut cupcakes. And the chicken to roast. All day in the kitchen? Yes and no. Halloween costumes have also been on the go this weekend. Tutus are getting made and floral crowns crocheted. Yes, I severely underestimated how much tulle I would need for a seriously poofy tutu but the effect is so good that 5 times more tulle has been ordered. TBC. Eims’ crochet flowers are amazing. She is addicted and I’m fanning the flames. Will it crochet? is to be our new mantra. Roses, azaleas, maybe a lily or two. Lil D is going to love her auntie-made floral crown and so will Eims.